This is not an ordinary shop. This is an experience. A place where you can relax, learn new skills and make new friends. This is a place of love and laughter. A place where everyone is welcome to walk into our hearts and be part of our lives. A place of sharing and caring. Come and be part of this special place. You deserve it because you are special. And while you are enjoying yourself in the relaxed atmosphere of the shop, you can have a coffee from our coffee shop. At lunchtime we can offer you a toasty or a pie. We have workshops on this machine on the second Saturday of each month from 9 am to 4pm. If you just want to have a play day using your machine in the company of friends and learning from each other the cost is $10.00. 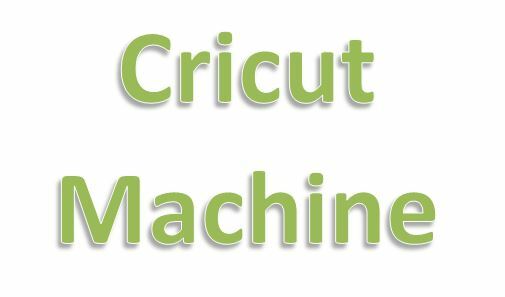 If you are a beginner and want help with your machine especially with the new machines – Cricut Explore Air 2 – the cost will also be $10.00. 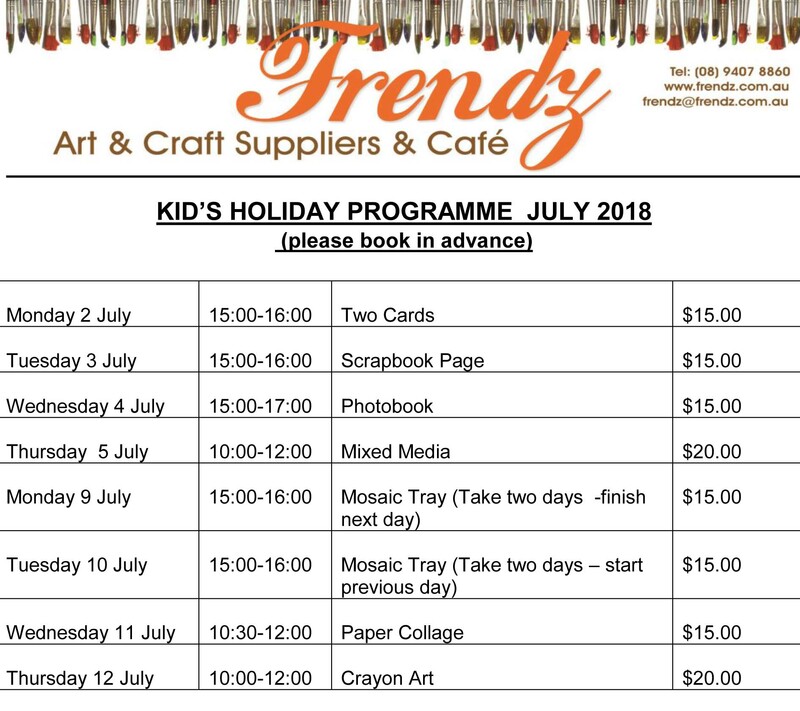 Please contact Sonja at 0439 849 864 for more information and to book a spot. We scrap on Tuesdays for the whole day as well as the third and fourth Saturday of the month. 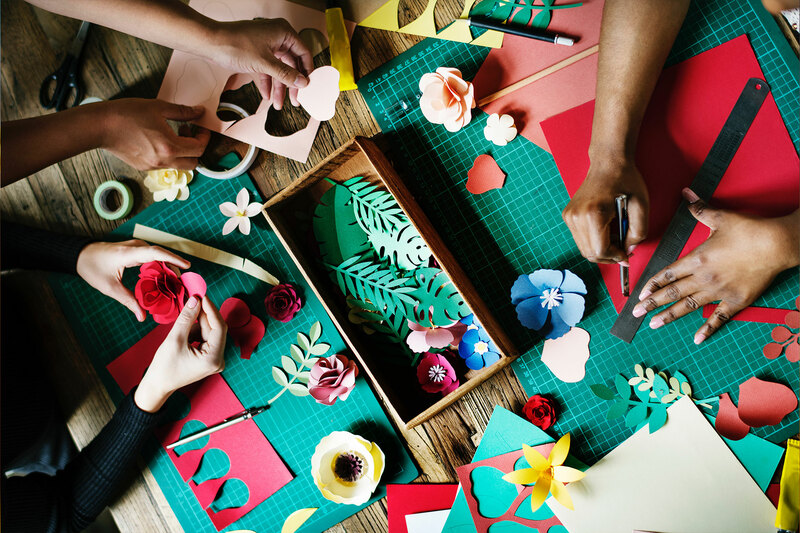 Bring your own projects and craft tools and enjoy the company of other lovely like-minded people. We laugh a lot, shed a few tears with other’s pain, have a coffee and find new friends. 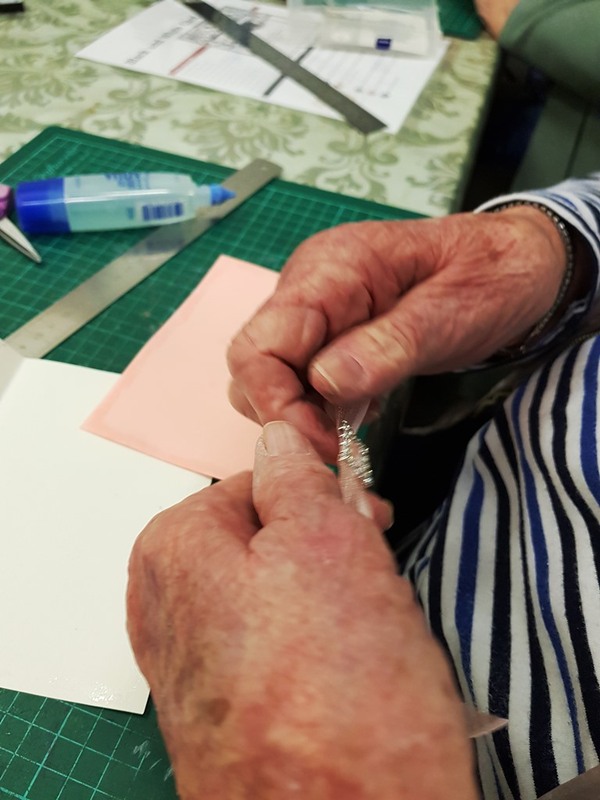 In between, we do our crafts and then go home with a smile and a feeling of belonging and sharing and love. Our interactive scrapbook pages are unique to this shop. This is our own designs and we are very proud of it. 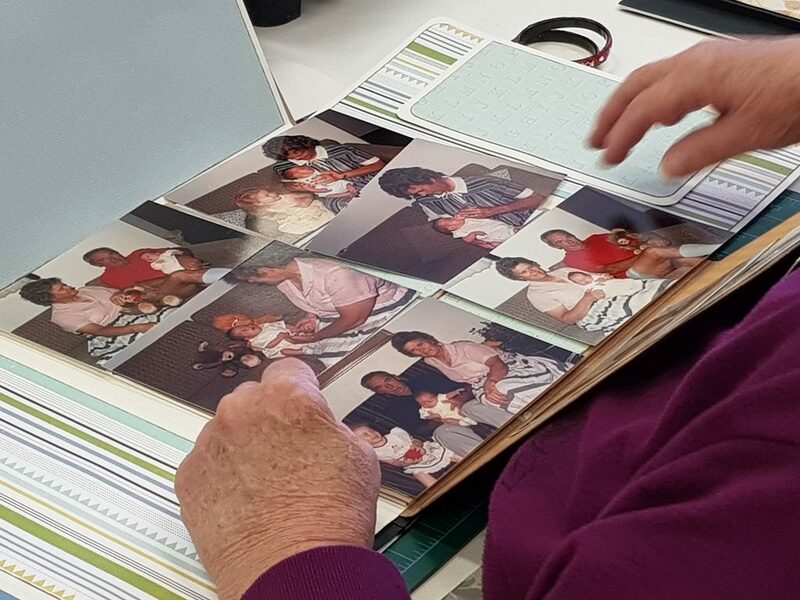 These pages have many flaps, folds and pockets and are designed to take up to 50 photos. You can put them in a 3 ring album. 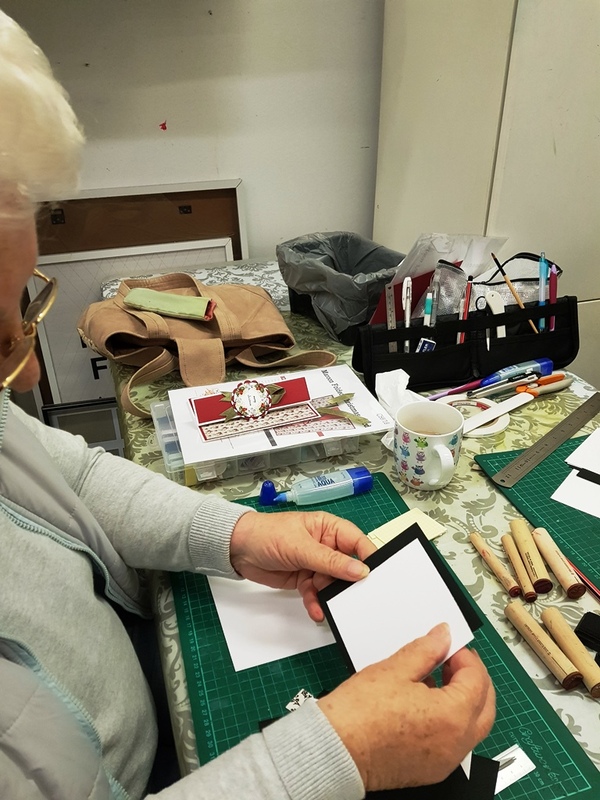 We have workshops on the interactive scrapbook pages every third Saturday of the month. We sell the interactive scrapbook pages as a kit ($25.00 per kit – this does not include the patterned paper). The cost for the workshop is $10. We also have YouTube videos available at $10 for each interactive scrapbook page. 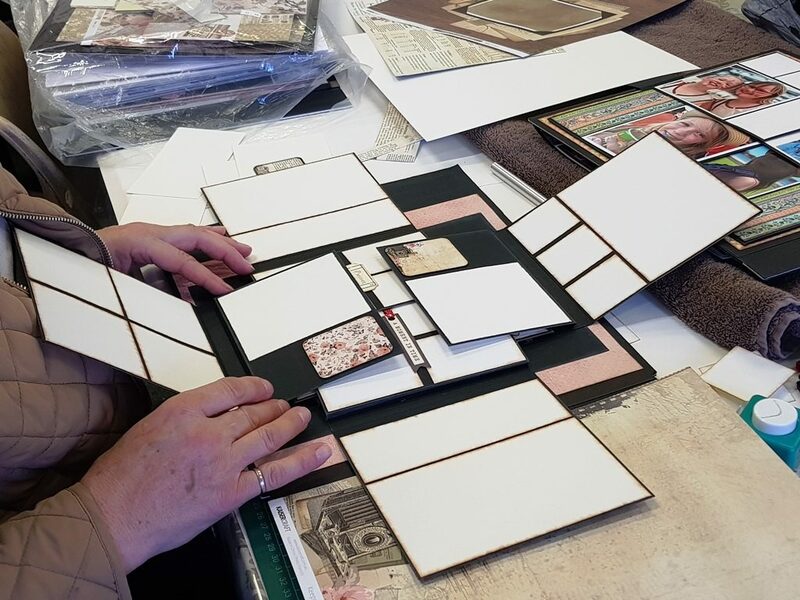 At the moment we have created 17 different interactive scrapbook pages. 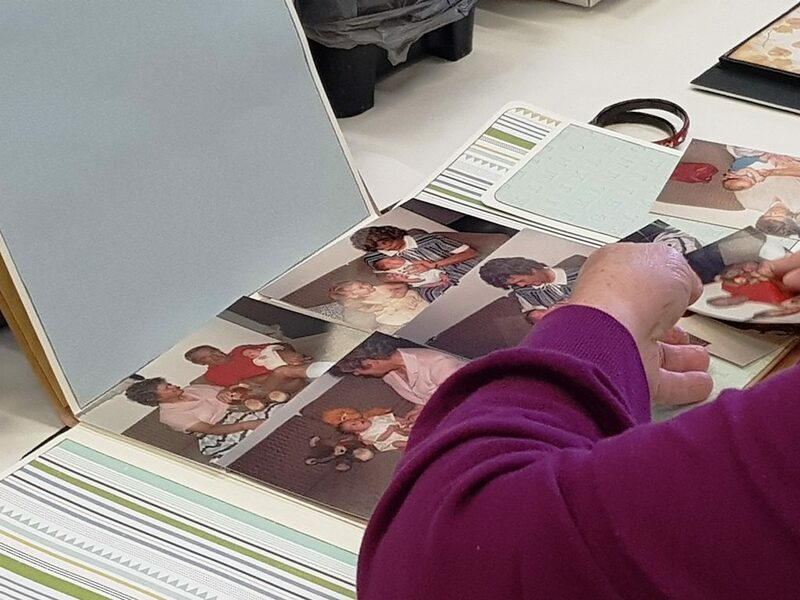 Workshops on our photobooks or mini albums are held on demand. If you want to make a mini album you can just contact the shop and we shall help you to create it. Prices vary as the albums are all different sizes. The cost is $5.00 for the class and $5.00 per card. 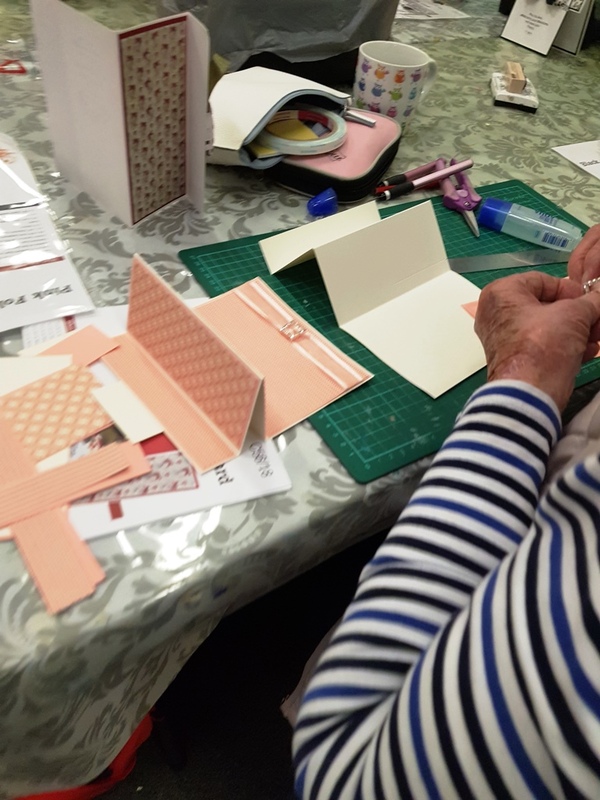 Each week we create three different cards, cut it and put it into kits. 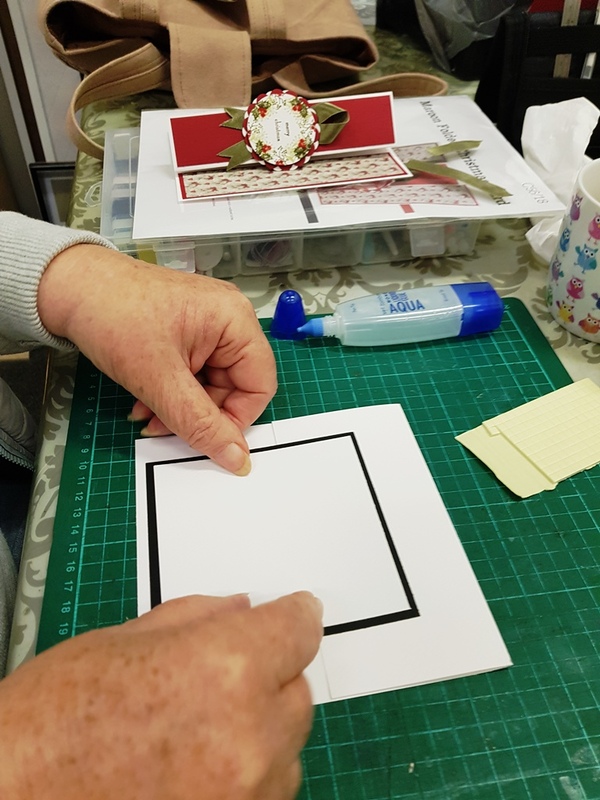 You can then make the cards that you like in the class. We try to teach you different techniques every week. Kits of the previous classes are also for sale. 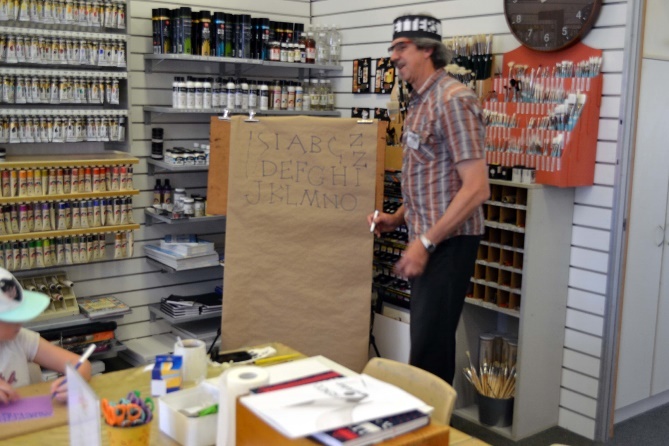 Martin is absolutely passionate about Calligraphy. He is a stunningly creative and fun teacher with a huge amount of knowledge of this old art form. He plays around with fun backgrounds, paper folds and then teaches you to write in a very special way. 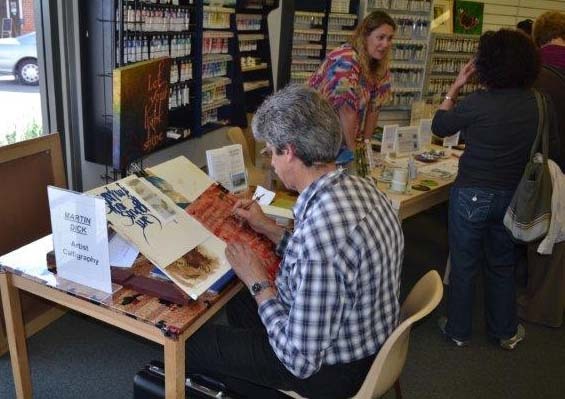 Martin will not only teach you to write in different hands, but he will teach you a lot about different inks and pens to use. Every class with Martin is filled with fun! Contact Martin at 9562 1247 or 0459 063 681. You can also e-mail him at dicarch@iinetnet.au for more information. Ever wanted to learn to paint? Pastels are a wonderful medium, whether you are a beginner or want to learn new techniques please join me. This 7-week course will give you a great understanding of all aspects of pastel painting. I am a pastel artist and paint our wonderful coastal beaches. I will guide you what brand of pastel to use when and where and what colour board to use for each individual painting. My classes start from a position of encouraging students to paint in their own style. I strongly encourage people to view images and translate what they see in their own special way. I am passionate about colour and will show you how to use it to enhance your work. I will encourage you to try new things, and push you out of your comfort zone by experimenting with new techniques. As a teacher, I am generous in sharing knowledge and provide you with live demonstrations. Above all, this is a class to have fun painting what we are passionate about. How to capture brilliant light into your paintings and create wonderful depth from a good understanding of colour, tone, perspective and form. How to use shadows to create undulating waves, understanding what colours to use for creating wet and dry sand, adding footprints in the sand and the various techniques for plant foliage depending on the season and time of day. The way to create dynamic waves, the use of shadow and light to capture various wave formations and painting the difference between deep water and shallow water. Janey has been painting fulltime since 1991 and has attained a high degree of respect in the art world from peers and art lovers alike. Janey has won numerous distinguished artistic awards for her work and sold many paintings throughout Australia and overseas. This talented artist is achieving the recognition her distinctive artistic talents deserve. We are very proud that she is available for teaching in the shop. Her work can be viewed on www.janeyemery.com. 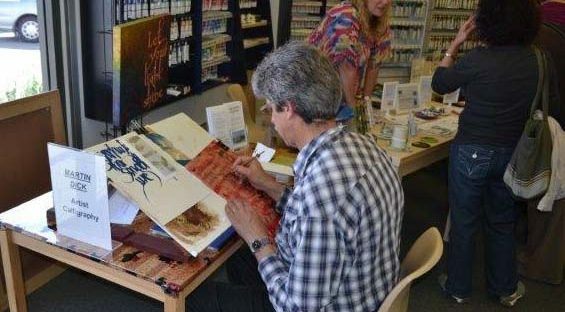 Geoff has been working with oils for more than forty years. He is an experienced and excellent artist and teacher well known in the art world. 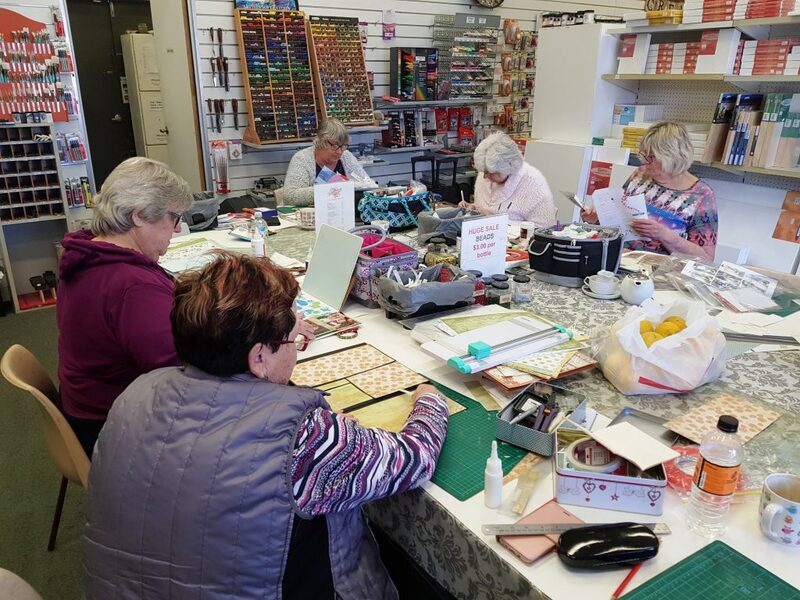 To learn how to be part of these classes you need to book in at the shop at 9407 8860. This is a very popular art to learn in a very relaxed atmosphere. The first four lessons will be an introductory course and you will paint a still life. 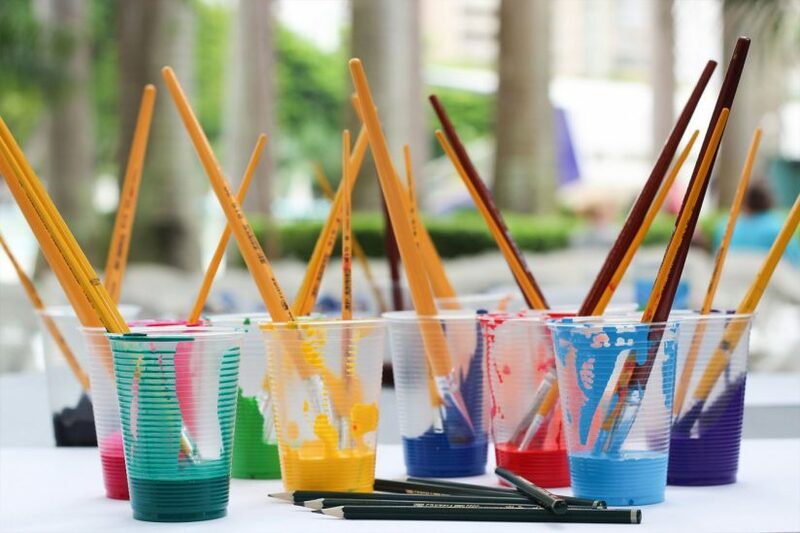 All the paints and mediums are provided during the four weeks. You only need to purchase a canvass. The cost for these classes will be $40 per class and will run for approximately three hours. If you want to continue with this art, you need to buy your own materials. The cost will be $40 per class of 5 to 6 hours. Geoff will always be here to help and teach you. Val Shaw is a soft-spoken, lovely and talented lady with a caring nature. It is a pleasure and privilege to have an artist teaching here with such a calm and loving way of working with people. She is an excellent artist as well!! Val is the Gallery Curator Coordinator Joondalup at Joondalup Community Arts Association. She studied in South Africa at UNISA and has a BA degree in Fine Arts. She also studied at the Natal Technikon and received a diploma in Textiles and Applied Arts. Please book ASAP because this workshop is very popular. Pewter explores the decorative modelling of a thin pewter sheet. It is a simple craft using basic tools to create decorative effects. 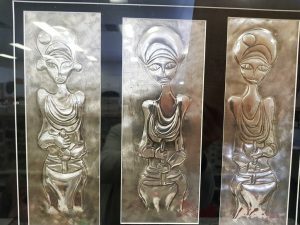 Pewter is all about creating an ornamental 3-dimensional design in a malleable metal sheet, giving volume and texture by raising, engraving and or embossing with the use of hand-held tools. We have the basic tools in our shop and have workshops in this lovely craft every Wednesday. As far as I know, we are the only shop in Western Australia where the craft of pewter is taught. We shall teach you all about the basic process of working with pewter and provide the tools that you will need. 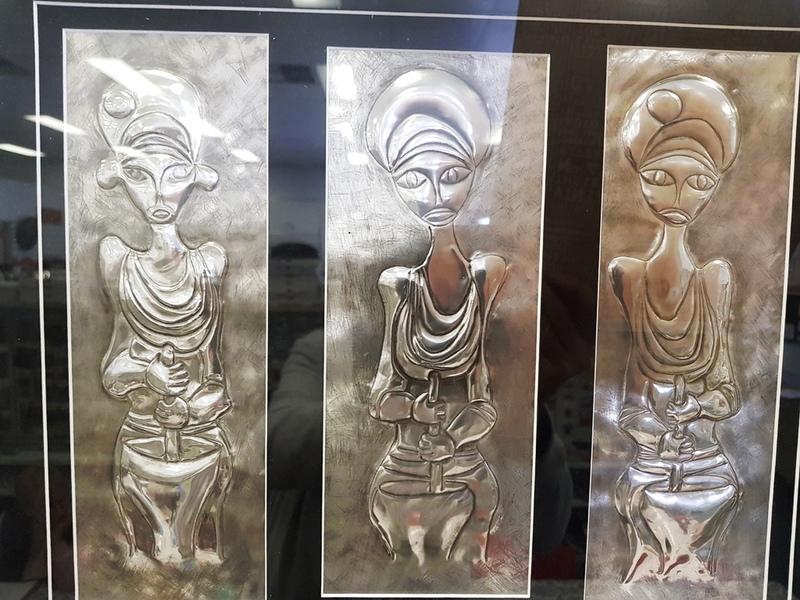 At the end of three hours you will be the proud owner of a lovely pewter object to frame or to stick on a box or any object of your choice. Our pewter classes are held every Wednesday from 10am – 1pm. The cost of the classes is $25.00 for the first lesson plus materials and $10.00 thereafter plus materials. Please book in advance. We sell the products that you will need for your projects in the shop. Mosaic is a medium of wide expressive possibilities. It is a playful art form and will change your life. Mosaic is made up of a selection of a collection of units – the mosaic tiles. It is cut, placed and stick down to form a pattern. 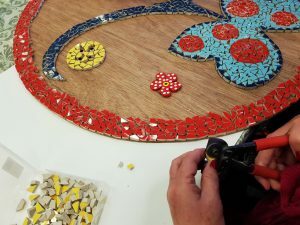 After the drying process, the grouting enhances and bring together the pattern. 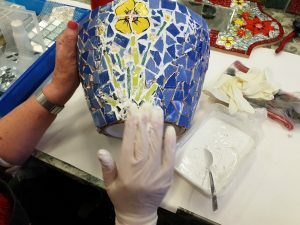 Our mosaic classes are held every Wednesday from 10am – 1pm. The cost for the classes are $25.00 for the first lesson plus materials and $10.00 thereafter plus materials. Bookings essential. Tiles and the cutting tools are available at the shop. We can also cut you a wooden blank to the size you prefer.